Program Contents: Pkg of 25, 11 x 17 four-page foldout. 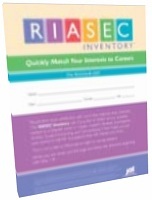 The RIASEC Inventory gives individuals a fast and informative way to explore occupations based on their interests. Using the RIASEC system developed by John Holland--the most widely used occupational interest coding system available--this inventory allows users to identify their job interests by responding to 72 work activity statements. Users are then guided through the process of matching those interests to potential careers and are given suggestions for further research. As one of the quickest and easiest assessments, the RIASEC Inventory is perfect for job seekers who have little time to spend on testing and career exploration. Furthermore, it’s highly compatible with a wide variety of occupational resources. Job titles featured in this inventory are drawn directly from the most current version of the O*NET. © Program Development Associates 1997-2011. All Rights Reserved.